Just hearing the name "Marco Polo" conjures up images of fantastic adventures in exotic places. Of all the explorers who traveled the Silk Route from Europe to China during the Middle Ages, he is by far the most famous. "Marco Polo's Travels," which vividly describes his 24-year journey in the late 1300s, continues to capture the imagination of readers today, even as it did hundreds of years ago. Now, more than 700 years later, a small American-based expedition team from GlobaLearn is making it possible for 90,000 students from all over the world to retrace Marco Polo's historic footsteps without leaving their classrooms. The idea came from GlobaLearn's 28-year-old Founder and President Murat Armbruster. For little more than the price of a telephone call, he realized that he could make far corners of the globe come to life for a virtually unlimited number of students, simply by sending an expedition team to explore an area and having them post daily reports on the World Wide Web. 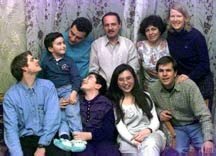 GlobaLearn's Expedition Team in Baku with Host Family of 12 year old Togrul Ahmedov. Amoco's Mehti Husseinov (top left) faciliated GlobaLearn's stay in the cities of Shaki and Baku, Azerbaijan. Photo: Globalearn (February 1997). Following the Silk Route is GlobaLearn's third expedition. Previous trips had been made to Turkey and the Black Sea region. The Marco Polo trip began in January 1997 and by June, the team of five explorers will have retraced the legendary passage from Venice across Europe and Central Asia to China and Hong Kong, traveling some 8,500 miles through 15 countries, eight mountain ranges, four seas and two vast deserts. Azerbaijan is part of their journey. The expedition team travels with state-of-the-art electronics and communications equipment such as portable computers, digital photo and video recorders, high speed modems and a mobile satellite transmitter. The data collected by the explorers is sent via satellite to the computer at GlobaLearn's headquarters in New Haven, Connecticut, where it is edited and formatted for presentation on GlobaLearn's Web site <http://www.globalearn.org>. Students "click" on a variety of topics to learn about the explorers' current activities. Highlights include daily expedition logs and journals, profiles of each city's host child, and explorer investigations or essays on the history, industry and commerce, environment and traditions of each city they visit. The GlobaLearn team visited Shaki from February 26-28 and Baku from March 1-4. In each city, the expedition team spent a day with students. "We look at the world through the eyes of children," says Armbruster who feels that the most sacred, the most innocent and truest feelings surface from their pure, inner world. Students can access explorer essays about Shaki's historic Caravanserai Hotel, the history of its silk industry and traditional Azerbaijani sweets. In Baku, their investigations focused on the Caspian Sea, the oil industry, the transition of Azerbaijan's currency from rubles to manats, historical tales and traditions of hospitality. Amoco sponsored the Azerbaijani portion of GlobaLearn's Trans-Asia expedition. During a press conference at Amoco's headquarters in Baku, Resident Manager Doug Hill noted how important it is for people to have accurate information about Azerbaijan, its culture and the mentality of its people. Mehdi Guseinguliyev, Amoco's Public and Government Affairs Coordinator, served as the In-country Coordinator for this expedition. Founded in 1993, GlobaLearn is a nonprofit corporation funded primarily by 20 companies and 500 individual donors. Future expeditions being planned by GlobaLearn staff include Brazil in Fall 1997 and an expanded tour of South America in Spring 1998.